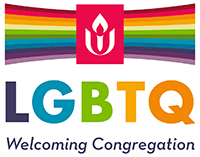 Unitarian Universalists draw from many traditions when creating our worship services. Each worship leader or minister may find different elements of different religions meaningful in their own lives and may wish to share this through the Sunday Worship service. Therefore, it would not be out of the ordinary to have a pagan influenced service, a service which draws on ideas from Judaism or Islam and a Christmas Eve service during any given year at the same church. In addition, Unitarian Universalists have developed some traditions which are uniquely our own. The flower communion was started by a Unitarian minister in Czechoslovakia who later lost his life at the hands of the Nazis. This uniquely UU tradition celebrates the gifts of community. At the end of the summer, many congregations observe an ingathering ceremony. The ingathering marks the end of summer travel and disbursement, back to school, back to work and back together. While we may glean from many traditions, we desire to honor these traditions but not to pervert them. Cultural misappropriation constitutes a serious lack of reverence to the sacred traditions, beliefs of indigenous and often oppressed people. In order to avoid cultural misappropriation, we strive to state the sources of our ceremonial observances plainly, openly and when possible to include the participation of native practitioners.